We ran into an issue with a customer this week. This error was flooding the error log. After a little digging, I found it had to do with transactional replication (also applies to Change Data Capture) they had set up which included LOB data. The max text repl size option specifies the maximum size (in bytes) of text, ntext, varchar(max), nvarchar(max), varbinary(max), xml, and image data that can be added to a replicated column or captured column in a single INSERT, UPDATE, WRITETEXT, or UPDATETEXT statement. The default value is 65536 bytes. In the error above you can see it plainly states that the column’s LOB data nvarchar(max), in this case, was 65754 bytes which was over the max default size of 65536. Which ironically is 64k. 64*1024 = 65536 (if you didn’t know). Adjusting the max text repl size for this server solved our issue. Below you can see the ways to change this value. For us changing it to the max value of 2147483647 bytes which is 2 GB was the way to go. If you don’t know the max value you can also set it to -1 which means no limit, the limit will be based on datatype limits. Previously, the limit was 2GB. At the Server Level right click and go to Properties. Click on Advanced. Under Miscellaneous, change the Max Text Replication Size option to the desired value. What is a Key Lookup? One of the easiest things to fix when performance tuning queries are Key Lookups or RID Lookups. The key lookup operator occurs when the query optimizer performs an index seek against a specific table and that index does not have all of the columns needed to fulfill the result set. SQL Server is forced to go back to the clustered index using the Primary Key and retrieve the remaining columns it needs to fulfill the request. A RID lookup is the same operation but is performed on a table with no clustered index, otherwise known as a heap. It uses a row id instead of a primary key to do the lookup. As you can see these can be very expensive and can result in substantial performance hits in both I/O and CPU. Imagine a query that runs thousands of times per minute that includes one or more key look ups. This can result in tremendous overhead which is generated by these extra reads and it effects the overall engine performance. The cost of the key lookup operator is 99% of the query. You can see it did an Index Seek to the IX_SalesOrderDetail_ProductID which is very effective, but that index did not have all the columns needed to satisfy the query. The optimizer then went out to the clustered index PK_SalesOrderDetail_SalesOrderID_SalesOrderDetailID to retrieve the additional columns it needed. You can see what it got by hovering over the key lookup in the query plan window. The good thing about Key and RID look ups is that they are super easy to fix. With a little modification to the non-clustered Index IX_SalesOrderDetail_ProductID we can change to query plan from an Index Seek and a Key Lookup to a very small index seek. All we have to do is recreate that index and add the Output List fields as Included columns on that index. And as you can see, we now have an Index Seek only and a more efficient plan. Key Lookups can cause performance headaches, especially for queries that run many times a day. Do yourself and your environment a favor and start hunting these down and get them fixed. Anyway, by now, you probably have seen documentation on Query Store and DBCC CloneDatabase. Query Store, introduced in SQL Server 2016, is considered the “black box” or “flight recorder” of queries. It retains a history of executed queries, including run-time statistics as well as execution plans from query store enabled databases. This flight recorder helps to diagnosis and pinpoint query performance issues. Another useful tool is DBCC CloneDatabase. This command was released in older versions via service packs before being fully released in 2016. This tool allows you to make a “schema” only copy of a database which will reside on the same server as the source database. The schema includes both user and system schema, as well as any corresponding statistical data. Let’s say you have a 1 terabyte database and wanted to perform query tuning on it. Storage is usually a premium commodity in most organizations and there isn’t a spare terabyte of storage just laying around. DBCC CloneDatabase would allow you to make a schema only copy, including statistics. Once the new database has been created, you could move the new database onto another server without having the requirement of large amounts of storage. Since the database is really a schema-only copy, the footprint of the database is pretty small. After moving the database, queries ran against it would utilize the statistics contained within to execute the query. True, there isn’t any data in the database, but you can account for that when performing query performance analysis. Creates a new destination database. Same file layout as the source database however with the default file sizes from Model. Generates a snapshot of the source database. Copies the system metadata from the source to the target database created in step 1. All object schema is copied from the source to the target. Index statistics are copied from the source to the target. Fairly easy and straightforward. But wait! There’s more! You will notice the “WITH NO_QUERYSTORE” option in the command. If you are running SQL Server 2016 SP1 or higher and utilizing the Query Store for the source database, DBCC CloneDatabase will also bring over the query store data! This is enabled by default so if you do not want the query store data, you have to explicitly define using NO_QUERYSTORE. This means, by default, if you clone a database you will get the flight recorder data from the query store as well. These two tools, query store and DBCC CloneDatabase, are just another means to help troubleshoot performance issues. Recently, I worked on a project to hide sensitive data. Basically, the client wanted sensitive data to be encrypted, then accessed and decrypted by the application only. In case a hacker or an employee or a DBA accesses data directly, they can't read the field. Some perfect examples are customer's credit card number, date of birth, social security, or even medical records. SQL Server provides a feature that allows DBAs and data developers to encrypt and save encrypted data on a column level. Once a column is encrypted, it's not readable by humans. In this blog, let's see how this can be acheieved. In the below example, I have used the Credit Card Number column to be encrypted. You need to write a stored procedure to execute a set of statements and queries. Though it is not a foolproof way to encrypt or decrypt at the database level, while working on this task, I learned some good techniques and features of SQL Server. There are 3 major factors to encrypt data at the column level, as below. Symmetric Key - can be encrypted by using many options, like certificate, password, symmetric key. There are different algorithms available for encrypting a key. The supported algorithms are DES, TRIPLE_DES, RC2, RC4, RC4_128, DESX, AES_128, AES_192, and AES_256. So, let's start step by step and achieve the encryption and decryption. Create a Master Key first with the help of the below script. use TestingDB; //This is the Test Database created. Once the Master Key is created, now it's time to create a Certificate. Now with the help of certificate and master key create SYMMETRIC KEY. Create symmetric key SK1 with algorithm = AES_256 encryption by certificate C1. Once all these KEYs are created in the database, we can use those for encrypting and decrypting data. Below is the script to encrypt the data in the column. Here I have created one TABLE named TestEncryption having 3 columns with its datatype as below. Note that the column in which we want to insert or update encrypted data should have VARBINARY as the datatype. Now it's time to check if the data is encrypted or not so when you execute a simple query you will get the data from the Table as it is. You will get an extra column named "Decrypted CC Number". This way we can insert/update and select the encrypted data from the table in SQL Server. A view is a virtual table in the database whose contents are defined by a query. A view appears just like a real table, with a set of named columns and rows of data. Unlike a real table, a view does not exist in the database as a stored set of data values. Instead, the rows and columns of data are generated from the query results defined by the View. System Views are predefined Views that already exist in the Master database of SQL Server. These System Views are used as template Views for all newly created databases. These system Views will be automatically created for any user defined database. The Information Schema Views are used to display information of a database, such as tables and columns. In SQL Server there are nearly twenty different Information Schema Views. Catalog Views are used to show database self-describing information. Catalog views are also used to return information that is used by the SQL Database Engine like objects, logins permissions and so on. DMVs are introduced in SQL Server 2005. DMVs gives the database administration information about the current state of SQL Server machine on various aspects. DMVs are easier to detect the health of SQL Server using these views. DMVs replace many of the DBCC Commands. All Dynamic Management Views (DMVs) exist in the sys schema and follow this naming convention dm_*. There are two types of DMVs. Server-scoped DMVs are Stored in Master Database. Server-scoped DMVs are used to for the state of an entire SQL Server instance. Server-scoped DMVs require VIEW SERVER STATE PERMISSION on the server. Database-scoped DMVs are stored specific to each database. Database-scoped DMVs require DATABASE STATE PERMISSION on the database. Sys.dm_exec_Cached_plans: Returns the information about query Execution Plans that are cached by SQL-SERVER for faster query execution. Sys.dm_exec_Query_plan: Returns the show plan in XML format for a T-SQL batch. Sys.dm_exec_Query_stats: Returns aggregate performance statistics for Cached Query Plans. Sys.dm_exec_requests: Returns information about each request that is executing within SQL Server. These are the views that are defined by the user as per the their requirements. A simple view is one that can be addressed by DML statements as well as SELECT. As might be expected, simple views are based on relatively simple SELECT statements. It can be used for retrieving data, as well as updating or deleting rows. Rows updated or deleted in the view are updated or deleted data in the table the view was created with. It should also be noted that as data in the original table data changes. A simple view can be created from a single table. A simple view does not contain functions. A simple view does not contain a group of data. We use Complex Views when we want to display data from two or more tables, using a group cluase or a grouping of aggregate functions. A Complex View can be created from one or more table. A Complex View contains functions. We can create views in 2 ways. Database views are created using the CREATE VIEW statement. Views can be created from a single table, multiple tables, or another view. In Object Explorer, expand the database where you want to create your new view. Right-click the Views folder, then click New View. In the Add Table dialog box, select the table that you want to include in your new view from one of the following tabs: Tables, Views, Functions, and Synonyms. Click Add, then click Close. In the Query Design Pane, select the columns or other elements to include in the new view. In the Criteria Pane, select additional sort or filter criteria for the columns. On the File menu, click Save view name. In the Choose Name dialog box, enter a name for the new view and click OK. The difference between TRUNCATE, DELETE, and DROP is one of the most common interview question. Here are some of the common differences between them. TRUNCATE SQL query removes all rows from a table, without logging the individual row deletions. The following example removes all data from the Customers table. We cannot use WHERE clause with TRUNCATE. Minimal logging in transaction log, so it is performance wise faster. TRUNCATE TABLE removes the data by deallocating the data pages used to store the table data and records only the page deallocations in the transaction log. Identify column is reset to its seed value if table contains any identity column. To use Truncate on a table you need at least ALTER permission on the table. Truncate uses the less transaction space than Delete statement. Truncate cannot be used with indexed views. TRUNCATE is faster than DELETE. To execute a DELETE queue, delete permissions are required on the target table. If you need to use a WHERE clause in a DELETE, select permissions are required as well. The following query deletes all rows from the Customers table. The following SQL query deletes all rows from the Customers table where OrderID is greater than 1000. DELETE is executed using a row lock, each row in the table is locked for deletion. We can use where clause with DELETE to filter & delete specific records. The DELETE command is used to remove rows from a table based on WHERE condition. It maintain the log, so it slower than TRUNCATE. The DELETE statement removes rows one at a time and records an entry in the transaction log for each deleted row. Identity of column keep DELETE retain the identity. To use Delete you need DELETE permission on the table. Delete uses the more transaction space than Truncate statement. Delete can be used with indexed views. DROP table query removes one or more table definitions and all data, indexes, triggers, constraints, and permission specifications for those tables. DROP command requires ALTER permission on the schema to which the table belongs, CONTROL permission on the table, or membership in the db_ddladmin fixed database role. The following SQL query drops the Customers table and its data and indexes from the current database. No DML triggers will be fired. The operation cannot be rolled back. DROP and TRUNCATE are DDL commands, whereas DELETE is a DML command. With the release of SQL Server 2017, a new TRIM() is also introduced which helps to remove the white space/characters from both sides of a string. Before 2017, this functionality was achieved by using the following SQL functions. I can explain the functionality with two scenarios. Let's assume, we have a string named ' ABC ' and we are going to eliminate the white spaces from both sides of the string. In SQL, we usually use the LTRIM and RTRIM function like in the code below. Now, this can be done by using a single TRIM function. Test results from SSMS can be seen below. Assume we have a string named 'X ABC Y' and we need to extract 'ABC' from that. As usual, we will go with the REPLACE function as follows. Here you go with the TRIM function. Test results from SSMS are shown below. Note - It is necessary that you have to mention the trailing charter in the TRIM function, otherwise, this will not work as expected. For example, if you try to remove the 'white space' only from the string 'X ABC Y', then TRIM will not help you. Similarly, if you don't mention the letter 'Y', TRIM will not remove the white space after the string, even though you already mentioned the 'X' and the 'white space' characters inside the TRIM function. See these scenarios in the below screenshot. If you want to find a record in a table without having an index, the system will scan the whole table to get that record. Well, this is a very costly operation in terms of time. For example, if your table has 10 million records, it will scan all these records to find the value. To overcome this problem, indexes are used. Indexes use the B-TREE search algorithm to search a record in a table, which is way faster than the table scan. Below are the frequently used types of Indexes. A clustered index is an index that defines the physical order of records to be stored in a table. Therefore, the table can have only one clustered index. A non-clustered index is similar to an index in a book. The data is stored in one place and the index is stored in another place. Here, the index has pointers to the storage location of the data. Therefore, a table can have more than one Non-clustered index. The syntax for creating an index. There are two primary benefits of using the Index on foreign key. When you delete a row from a parent table, the SQL Server checks if there are any rows which reference the row being deleted in the child table. To find the rows efficiently, an index on the foreign key column is extremely useful. Using Index, SQL Server can more effectively find the rows to join to when the child and parent tables are joined. Can we have multiple indexes on the same column? As you can have only one clustered index per table, you cannot have multiple clustered indexes on the same column; however, you can have multiple non-clustered indices on the same column. SQL Server 2016 Hosting - HostForLIFE.eu :: How to Scheduling Things To Run In SQL Server? 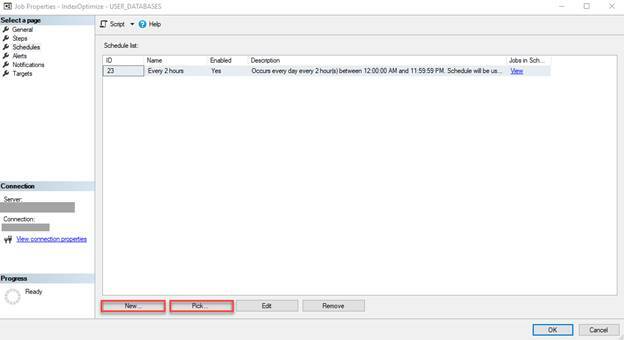 A key part of the SQL Server Agent is the ability to schedule jobs. While you can create one schedule for each agent job, frequently with applications like Reporting Services, users use Shared Schedules across multiple jobs. For instance, you can set a schedule to run at 8 am on week days or run every 2 hours or pick from a predefined list of schedules that already exist in the MSDB database. These are very convenient. However, if you choose to use these be sure you are keeping track of what is running for each of these shared schedules. You should not have everything running at once. 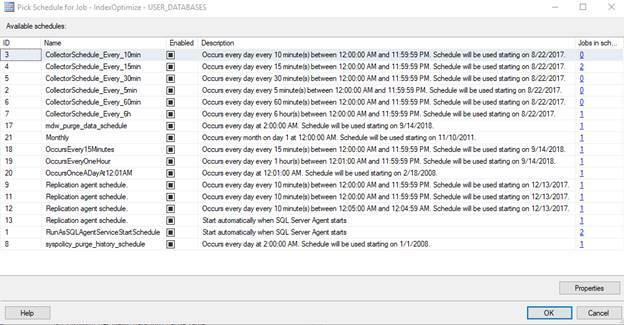 This is an example of a job schedule in a Management Studio SQL Server Agent Job. You can create a new one or pick from a list of already made schedules. There’s nothing inherently wrong with using shared schedules—some very small operations can all run at the same time, however when you start to use them for larger operations you can really impact the overall performance of your server. Many times, I have seen high CPU or locks as well as many other performance issues due to the system being overloaded with jobs running on shared schedules or all at the same time (midnight is a frequently common choice). Not every report to should run at 8 am and every data load run every 2 hours. If you not using shared schedules or added a separate schedule per job it is also important to make sure you are not running up against other things running. If you are using applications like SSRS, then you need to pay attention to when the report subscription refreshes are happening. Don’t overload your system by having everything run at once. Job and subscription schedules need to be analyzed and evaluated just like everything else you care for in your database. To keep this from happening consult your agent jobs to see what other jobs are running before scheduling additional ones. You can easily get a glimpse in Job activity monitor to see what’s running and when it will run next. To find the ASCII value of an alphabet or a number, we can use ASCII function in SQL Server. We will see how to get the ASCII value of numbers from 0-9 and uppercase and lowercase alphabets. ASCII (American Standard Code for Information Interchange) is the most common format for text files in computers and on the internet. In an ASCII file, each alphabetic, numeric, or special character is represented with a 7-bit binary number (a string of seven 0s or 1s). There can be 128 possible characters defined. It serves as a character encoding standard for modern computers. ASCII value of capital A is 65 and Z 90. To find the ASCII values of alphabets from A to Z, use this code. To find the ASCII values of characters from a to z, we can use this query. To find the ASCII value of numbers from 0 to 9, we can use this query.